Please call owner Robert at 865-988-8562 or 865-567-6214. Designed to appeal to those who appreciate versatility. This 1993 Carver Voyager features 2 Stateroom Floorplan, Sleeps 8, with the Galley and Dinette on the same level which affords Excellent Visibility and Lots OF Storage. Two Refrigerators, Stove, Microwave, H&C Water, Dockside Power, Air Conditioning reverse cycle to Heat, New Carpeting, Upholstery and Window Blinds. Bathroom includes Standup Shower with Glass Enclosure. Fresh Water Boat which has been Professionally Maintained. Powered by two Volvo 7.4L Engines with 330 hp each. Boat includes Depthfinder, VHF Radio, AM/FM/CD Stereo, Swim Platform, Trim Tabs, Hydraulic Steering, Full Canvas Enclosure with Tonneau Cover for the Bridge, Coast Guard Safety Pack, Halon in Engine Compartment, Two Bilge Pumps, and Anchor with Windlass. 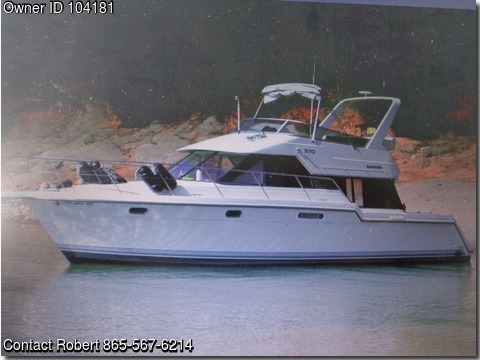 For more information or to make an appointment to view boat, please call Robert at 865-988-8562 or 865-567-6214. Also, a 20x40 floating boat slip is available for $15,000.